I was scratching my own itch - after trying every product out there (and even switching my domain to gmail) - I just couldn't find a product that kept my inbox clean with only the most important and urgent emails. Many products got "close" but were either difficult to configure, or had some auto-rules that allowed important messages to slip through the cracks. 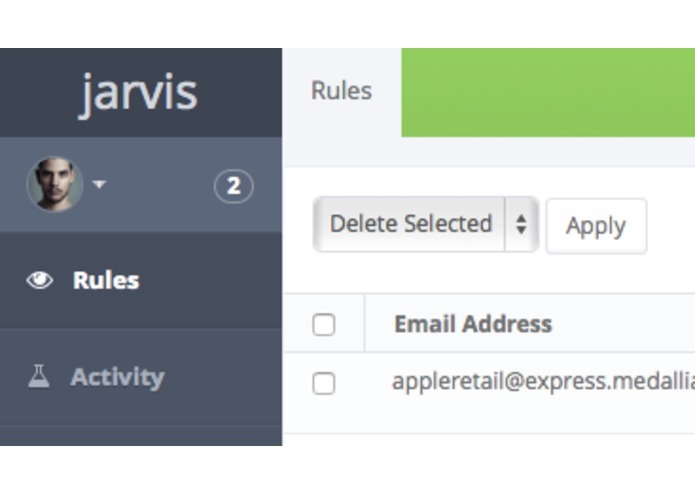 Jarvis Mail allows a user to quickly and simply create email rules that keep the most important mails in the inbox, and send everything else to a "Read Later" folder. Rules can be created from any device, and any client, just by dropping a mail into the Read Later folder. In addition, using the same smart rules engine, a user can easily create additional functionality from their inbox. Think of it as IFTTT or Zapier, for your inbox. Want to read a newsletter on Pocket? Done! Want to get a Text Message anytime you get emails from an important person? Done! Want to process receipts and expenses easily? Done! We're working on more cool integrations and workflows now! This app uses the Context.IO APIs and Webhooks to monitor email accounts, as well as specific folders. When the hooks fire, our rule engine process the email and performs the workflow.